My post-exam celebrations were supposed to involve lots of knitting, but someone of the small variety has had other ideas. And the list of cleaning jobs is getting so long it can no longer be ignored! I have managed a few rows, but maybe tonight's the night! We're in the process of getting our winter vege patch going, and added a whole lot of our own compost to the garden bed a few weeks ago. Along with several varieties of weed, there seem to have been several seeds waiting in the compost for just this moment, and we've got things springing up everywhere! But apart from the tomatoes, we don't really know what the other things are. Can you help? I'm wondering whether this one's a pumpkin or zucchini or something. Do you know? The other question is about what to do with them. Knowing our luck, they'll all be summer veges, so I'm assuming that means pull them out (like I plan to do with the 57 tomato seedlings that have come up). BUT, if they're winter veges, is it silly or prudent to transplant them into a more appropriate place (than in the middle of the spinach)? Or are self-sown veges just a disappointment waiting to happen? I have no idea - I'm not really much of a gardener. I was just laughing at your comment about "adding our own compost" - sounds like you've been pooing in the vegie patch!! 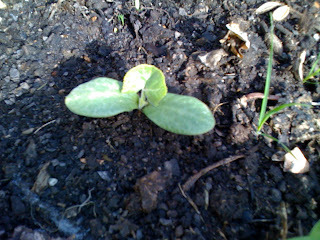 pumpkin, watermelon, rockmelon and zuchinni all look pretty similar at the beginning... if you're okay with where they've sprouted I'd just leave them there - it has done good so far. 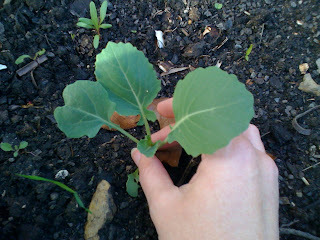 I am pretty sure the first one is cauliflower as I have some growing in the garden. The second one could be cucumber. I have one tiny seed growing in my vege patch but I dont know how it will go with the cold weather. The cauliflower is fine to plant now. Mine are quite big in just a few weeks. I also have some wonderful lettuces growing too. I even have a stray tomato plant in the front garden from the compost so I am keeping my fingers crossed that I might get a tomato or two. I suppose it depends on whether the bees are still buzzing around when it flowers. The 2nd one looks like zucchini to me, but i am an amateur. Good Luck with the growing and harvesting to come! xo m.
The second one looks like pumpkin to me. We get heaps of them coming up in our compost bin. Let it grow and see what you get! Top looks like a broc or cauli, bottom one is most likely a pumpkin of whatever variety you normally buy, they survive composting and thrive when it is spread. In our case it's always butternut. Right season for the broc/cauli, end of growth season for the pumpkin (maybe zucchini, etc) but it may survive until spring and then go mad over summer. We have had the best self sown tomatoes and butternut pumpkins, I figure if they're happy to come up then it must be the right climate for them, even if it's not their usual growth season.